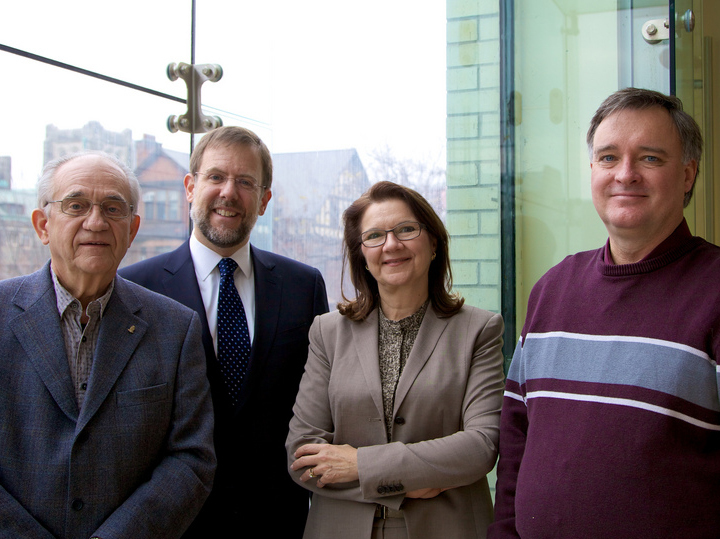 John Edgar McAllister Foundation trustees Bob White (far left), former U of T chief financial officer; and McAllister’s great-great-nephew Mark Ridge (far right – ChemE 8T4) joined U of T Engineering Dean Cristina Amon and Executive Director of Advancement Jim Dawson at the scholarship luncheon with students in November. On the second floor of the Galbraith Building hangs a stately portrait of John Edgar McAllister (CivE 1895), a man who is still making his mark at U of T Engineering today. His trust has provided scholarships to thousands of engineering students over the past 50 years. At a luncheon on November 28, some of this year’s 23 recipients had a chance to learn about this notable alumnus and show their gratitude for his support. McAllister entered U of T Engineering long before provincial student assistance programs were offered. He received one of the few scholarships available and excelled in his civil engineering studies, but his lack of wealth and connections made it difficult to launch his career. He was eventually able to build a consulting business with offices in New York and Toronto. When he died in 1959, he left a small estate and a wish: to establish a trust that would provide aspiring engineers with financial support so they could focus on their education, instead of worrying about paying for tuition. Trustees Bob White, a former U of T chief financial officer, and McAllister’s great-great-nephew Mark Ridge (ChemE 8T4) ensure that support is provided in the form of annual student bursaries and scholarships at both U of T Engineering and Michigan Technological University, where McAllister later studied mineralogy. The original $1.5 million estate has grown more than fourfold over the years due to the trustees’ careful financial management and investment. The estate trust has, to date, provided annual gifts to the Faculty of Applied Science & Engineering for student aid in excess of $6 million. The trustees meet with the Dean annually to ensure that John Edgar McAllister’s wishes are carried out as he directed and that as many students as possible continue to benefit from this legacy. For the past eight years, the John Edgar McAllister Estate Trust has made an even bigger impact on U of T Engineering students by contributing part of its annual gift into an endowment fund matched by the province of Ontario, which is now worth over $2 million. Together, the estate trust and endowment add up to more than $8 million. As the endowment grows, McAllister’s trust can continue and enhance support to future generations of engineers.